Ideal for investment banking, equity research, and real estate professionals with a focus on REITs. Trainees build financial and valuation models for a REIT the way it's done on the job. At completion, trainees will have developed a comprehensive REIT model from scratch. First, we will learn about the REIT industry’s unique drivers and challenges. We will then build REIT financial and valuation models from scratch, using a step-by-step approach for an actual company, BRE Properties. Along the way, we will cover modeling best practices for same store properties, acquisitions, developments, and dispositions. In addition, we model and deconstruct critical REIT profit metrics like FFO, AFFO, and CAD. Part 2 dives into valuation modeling, with a focus on the Net Asset Value (NAV) approach. Wall Street Prep's Real Estate (REIT) Modeling course is used at top financial institutions and business schools. 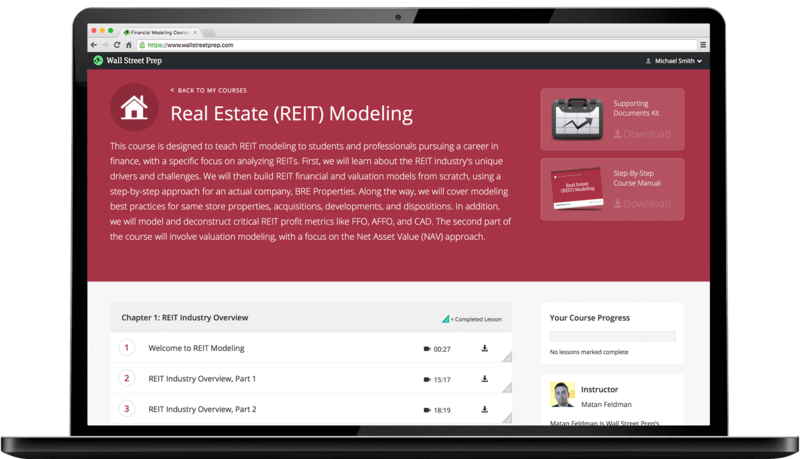 Wall Street Prep's Real Estate (REIT) Modeling Course delivers step-by-step lessons through videos, readings, ready-to-use restructuring financial and valuation models and exercises using a real case study. The Real Estate (REIT) Modeling Self Study program bridges the gap between academics and the real world and equips trainees with the practical financial skill set needed to succeed on the job. The program utilizes a case study format, as students follow their tutorial guide alongside the Excel model templates, and are directed to the appropriate external documents (SEC filings, research reports, etc.) in order to build complex Real Estate (REIT) models the way they would on the job. Upon enrollment, students gain 24-month free access to Wall Street Prep's Online Support Center, where they receive answers to questions, free downloads, and important updates. Wall Street Prep provides its clients “lunch and learn” webinars on a variety of industry-specific and advanced topics that are of particular interest to investment banking, private equity and corporate finance professionals. As a Real Estate Modeling trainee, you will gain access to all of these webinars, along with archived versions of past webinars. This course does not assume a prior background in Real Estate (REIT) Modeling. However, those who enroll should have an introductory knowledge of accounting (e.g. interaction of balance sheet, cash flow, and income statement) and proficiency in Excel. Students with no prior background in Accounting should enroll in the Accounting Crash Course. Students with limited experience using Excel should enroll in the Excel Crash Course. My main goal when signing up for the REIT modelling course was to obtain a job as a research associate on the real estate team at a major Canadian bank. I was already in the interview process (and still am) but wanted to have a high quality report on a REIT ready so I could send it to the analysts as an example of my work. The course touched on a lot of areas I was weak on, and also made me realize I was doing some things wrong in prior reports. Overall I was happy and satisfied. It definitely helped me and made me feel more confident, as well as increased my knowledge level. Still in the process of interviewing, but I have advanced through multiple stages thus far, and feel confident moving forward. I am currently a director in MUFG Mexico in Energy (Oil,Gas, Power & Utilities), Mining, infra and some retailers. This course was more of extra curricular learning for me, as we don't cover RE but I am very interested in the sector and have some future projects that relate to REITs in Mexico and other RE investment. It helped me better understand a new industry and improve my technical skills. I had previously taken your financial modeling and DCF courses to polish and refresh my modeling skills and the courses were super useful. Here, the explanations of how REITs work and the step by step explanations are very clear and easy to understand, even for someone like me who has limited experience in RE.